Daisy Rockwell did both. And bin Laden isn’t the only terrorist the New Hampshire artist has painted since September 11, 2001. She recreated a photo of terrorist suspect Mohamed Mahmood Alessa embracing his beloved cat, Tuna Princess, on a pillow-strewn bed. She also painted Aafia Siddiqui, known as “Lady Al Qaeda,” smiling demurely in her graduation gown and clutching a bouquet of red flowers. 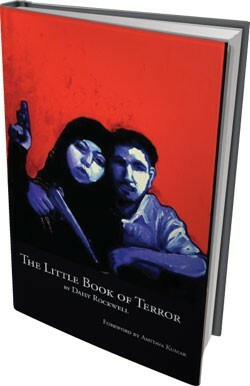 They’re all part of a series of portraits — as well as essays and commentary Rockwell has contributed over the years to the blog Chapati Mystery under a pseudonym — that appear in her new book The Little Book of Terror. Rockwell — granddaughter of Norman — will sign copies at a release party on March 30 at the Main Street Museum in White River Junction. But terrorists aren’t so scary when they’re cuddling with their cats. And since the war on terror is, by definition, “a war on an emotion,” Rockwell says, dismantling that fear factor is crucial. The writers and commenters on Glenn Beck’s website, the Blaze, see it differently. Earlier this month, when the right-wing blogosphere caught wind of a CNN article about Rockwell’s new book, they quickly branded her a terrorist sympathizer. “Daisy Rockwell isn’t necessarily following in her grandfather’s footsteps,” the Blaze post begins. On one level, Rockwell agrees — Norman Rockwell’s early paintings of quaint American life are a striking contrast to Daisy’s images of religious extremists. But there are similarities, too. Especially if you look at some of her grandfather’s later paintings, such as “The Problem We All Live With,” in which a 6-year-old African American girl named Ruby Bridges makes her way calmly into an all-white New Orleans school in 1960.